In a companion paper, the response of a two-degrees-of-freedom ship model with nonlinear coupled pitch and roll modes under sinusoidal harmonic excitation was studied analytically by means of the Multiple Scales method for the case where the pitch frequency is twice the roll frequency. Five resonant cases were analysed and the governing equations for the transition towards the steady-state solutions, the first-order approximations for these solutions and the frequency-amplitude relationships were derived. The present contribution aimed to verify the accuracy of the analytical results by contrasting them with the numerical results provided by direct integration of the equations of motion. The two sets of results were found to be in excellent or, at least, in decent agreement every time the system parameters were selected without a flagrant violation of the order’s magnitude. 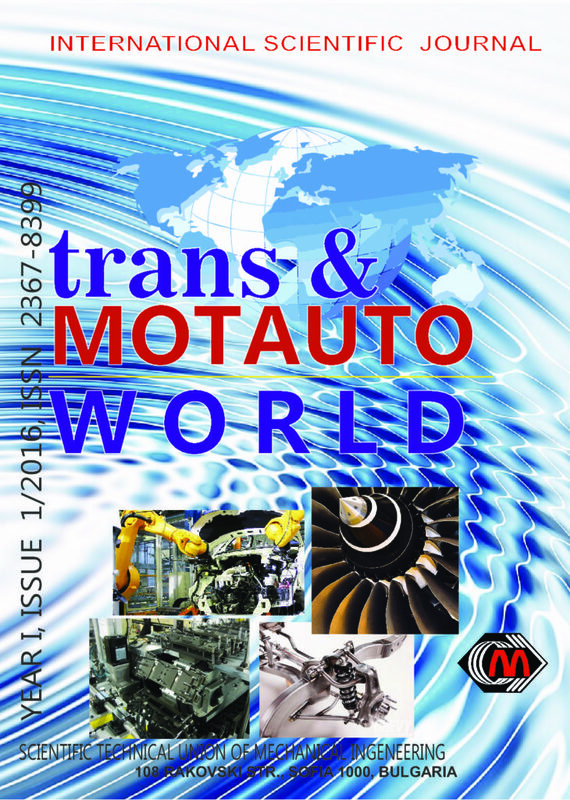 The article substantiates the ways of tuning parametric oscillations providing for increasing durability of steel and friction plates of vehicle transmissions. The evaluation of dynamic stability is conducted on the basis of the analysis of Mathieu equation and Ince-Strutt diagram. It is offered to restrict the parameter of rigidity modulation depth by filtering low-frequency disturbances formed in the nonlinear system by the power unit (internal combustion engine (ICE) or electric motor (EM)), by hydrodynamic processes in the hydraulic transformer (torque converter or hydraulic coupling) and in the system of its oil supply. The performance evaluation of the developed actions on plate’s durability is conducted. In this work a method of vehicle-pedestrian accident reconstruction in case of unlimited driver visibility and accelerating vehicle moving is presented. This method presents are mathematical models for determining the pedestrian visibility time, vehicle speed at the moment of impact, time to vehicle move from the moment of the hazard occurrence until the moment of impact, the vehicle distance from the place of impact, stopping distance, etc. In the paper, a two-degrees-of-freedom ship model with quadratic coupled pitch and roll modes under sinusoidal harmonic excitation is considered. The Multiple Scales perturbation technique is applied to yield the first-order expansions for the special internal resonant case where the pitch frequency is twice the roll frequency. Increasing the wave frequency from zero to infinity, five resonant situations are detected. For each case, the governing equations for the transition towards the steady-state solutions, the first-order approximations for these solutions and the frequency-amplitude relationships are presented. A detailed analysis is performed only for the case where the excitation frequency is half of the roll frequency. The reliability of the analytical results derived in the paper is checked in a companion contribution by comparison with numerical solutions. In recent years, many researches in the field of electromobile transport using as driverless vehicle are carried out in Russia as in the world. Operation electromobile transport in Russia has specific features, among which are the cold climate and heavy traffic conditions. One of the key elements of the functioning of electromobile transport is an energy storage system, the characteristics of which are highly dependent on how and under what conditions the vehicle is operated. The life of the energy storage system is also adversely affected by high temperature and short overvoltage on its elements. To increase the mileage of vehicles on the electric energy storage provides an improved system design, and in this article the experience of creating such an energy storage system for the driverless vehicle, taking into account including the Russian operating conditions. In the process of creating energy storage system were carried out calculations, mathematical and natural layout the basic elements of the system. A major part of working operations performed by a motor-grader is accompanied by asymmetric action of the resultant vector of external resistance forces applied to the main blade. The eccentrically applied horizontal loads together with additional lateral forces affect the parameters of the machine road-holding ability resulting in deviation of its actual trajectory from the planned one. In the presented work on the basis of the developed model there have been analyzed the impact of operational characteristics of the working process on the indicators of the machine road-holding ability. The article discusses optimization of barge hull by decreasing of its mass parameters by changing of thickness of the plates. The fish-feeding barges are usually used in calm water and in this case it is possible to consider only static loads applied on the barge hull. There are many calculation methods for determining stress and deflections in the thin plates. A lot of them are using uniformly distributed load and constant thickness of the plate. In real conditions, a hydrostatic pressure is applied on the barge hull. In this research, we consider a calculation method of thin plates taking into account variable thickness of the plates and non-uniformly load. In addition, we try to show by experiments and FEM analysis the possibility to use variable thickness of barge hull in building of fish-feeding barges. A waterway is not consists of sections have constant loading gauges and – because of this – constant throughput capacity. The waterway categories themselves are suggesting to the different capacities, however the effective quantification is a significantly more complex task. The navigable section of a river consists of heterogeneous lines with space and time-varying characteristics because of its morphology and hydrology. The study examines the factors to prepare specific calculation. The paper is focused on a benefit of urban traction units with tilting system particularly in regional transport, on reducing travel times and on increasing the competitiveness of railway transport. The paper describes the importance of its utilization in such traffic especially if the infrastructure is unable to provide options of higher efficiency for railway undertakings. In this cases are the investments for line optimization not available, so railway undertakings cannot be more efficient by usage of classical vehicles. There is space for research of the possibilities of increasing the quality of transportation process despite the state of the infrastructure. The King david the Builder Kutaisi (Kopitnari) International Airport is located in the Black Sea region of the South Caucasus. The Airport’s strategic geographic position and further improvement of the infrastructure allow for its transforming into the regional hub for providing transport services to travelers. In the 1980s, the flights from this airport were carried out as inside the country (Tbilisi, Sokhumi, Batumi, Mestia), so outside country as well (Moscow, St. Petersburg, Kiev). The Kopitnari Airport was opened after reconstruction in 2012. Its priorities are attraction to attract low-tariff airline companies and create a harmonic environment between the airline companies and airports. As of today, the flights from the Airport are carried out to Eastern Europe, Turkey and Russia. The Airport has the capacity to carry out domestic flights for small tourist groups to: highland ski runs in Mestia; well-appointed Black Sea beaches in Batumi; wine tours in Telavi and so on. Proximity to the trunk railroad and motoring highway are the opportune occasions to form the Kopitnari Airport as a synergic transport system. Besdies, the Airport’s proximity to the Rioni River can be used for organizing there the short tour of the so-called “Travel of Argonauts to Kolkheti”, which was passed by the well-known traveler Tim Severin by his oared boat named “Argo” in 1984, and the place where he finally dropped anchor was near the Kopitnari Airport.